Josh Turner submitted this photo and caption. My name is Josh Turner and I marched as a member of the Colts tenor drum line during the 2007 Drum Corps International season. I also marched as a member of Gateway Indoor this winter. 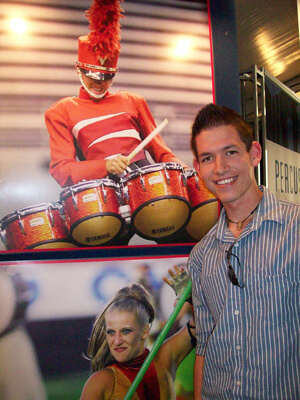 This past weekend at the Winter Guard International World Championships I saw this poster of myself at the DCI booth in the marketplace. It was a very cool to see because I love both the indoor and outdoor activities. At the end of of a great WGI season, it made me very excited to get back on the road this summer. Thanks DCI!